Here's an Ohio Star quilt block variation with half square triangle units in the corners of the block instead of the plain squares we see in the traditional Ohio Star design. The two blocks can be used side by side to add a diagonal pathway where corners meet. If you prefer, the variation can be repeated throughout a quilt. Try using different fabrics in the corner triangles to create more color play when blocks are joined. One set of HST units is sewn in the corners. Another set is sewn slightly larger to use as parents for the quarter square triangle units that create the star tips. Many quilters like to cut fabric for HST units larger than needed, and then trim back the units to the exact unfinished size after assembly. Alter cutting sizes if you prefer that method or if you use a different technique to assemble the units. Find the two background and darker squares you cut for the block's corner half square triangle units (dimensions end in 7/8" for all sizes unless you cut large to trim back later. Pair one of each contrasting square. Use my ​quick pieced half square triangle method to make four half square triangle units from each pair. Units for the 9" block will measure 3-1/2" x 3-1/2" square when complete (4-1/2" x 4-1/2" for the 12" block or 2-1/2" x 2-1/2" for the 6" block). 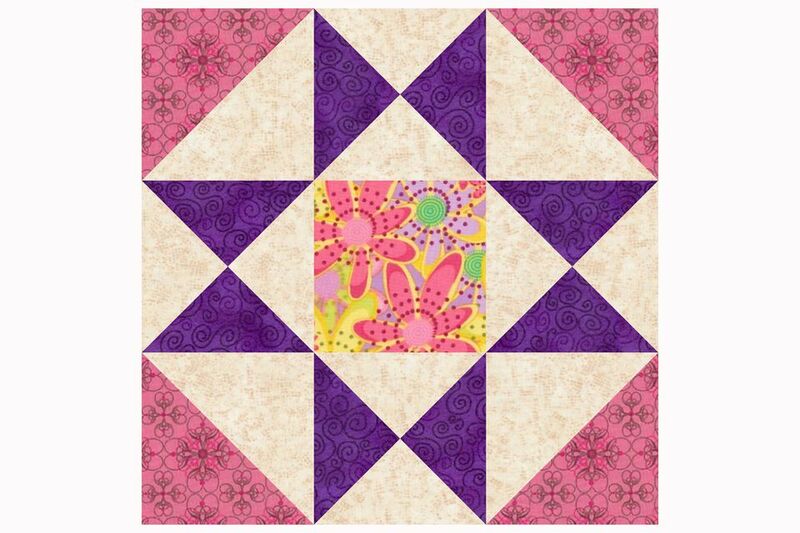 Pair contrasting squares set aside for the star tips (dimensions will end in 1/4" for all sizes). Use the same method linked above to make quarter square units. Completed units should measure 3-7/8" x 3-7/8" for the 9" block (4-7/8" x 4-7/8" for the 12" block; 2-7/8" x 2-7/8" for the 6" block). Trim back to one of those sizes if you sewed with larger squares. Place two of the Step 4 units right sides together, contrasting fabrics facing each other. Mark a line, sew together and cut them apart as before -- the line and new seams are perpendicular to the existing seams (quarter square triangle instructions). The quarter square units should match the dimensions of your corner units and block center. Arrange the components into three rows as illustrated. Sew components in each row together with a quarter inch seam allowance. The 9" block should measure 9-1/2" x 9-1/2" (others, 12-1/2" x 12-1/2" or 6-1/2" x 6-1/2"). Try the Magic 8 method for HST unit assembly if you plan to make several identical units.